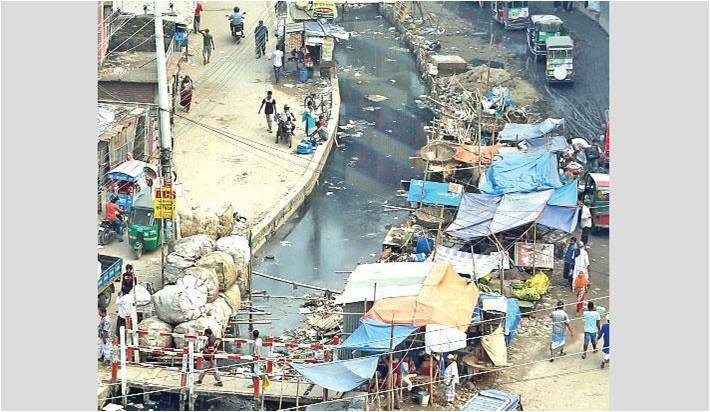 In last 30 years, the mega City of Dhaka, the most populated Capital of the world, has lost 50 canals due to encroachments that have resulted in collapse of the natural drainage system leading to catastrophic urban flooding in normal monsoon. Dhaka is one of the fastest growing Megacities of the World with a growth rate of 4.4% per year. 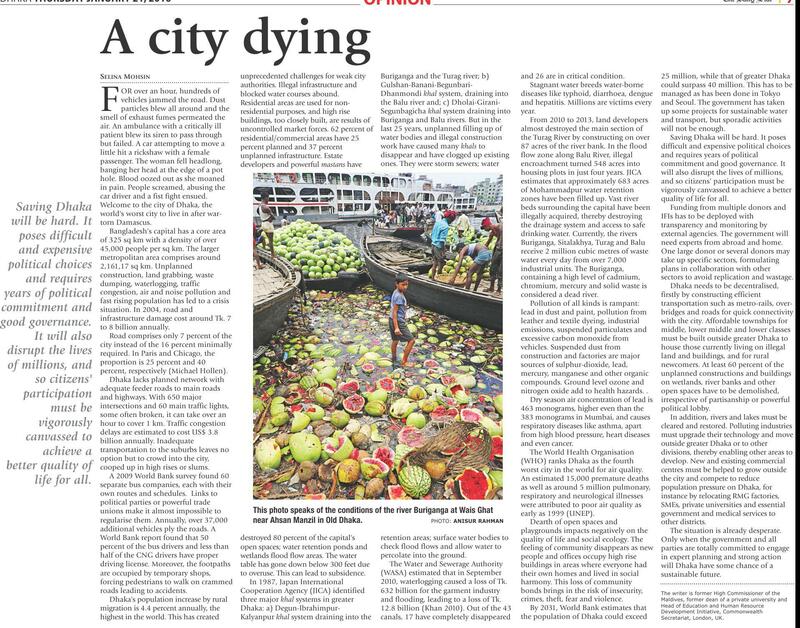 Urbanization in Dhaka has been rapid and demand driven with little care given to the inevitable environmental and public health consequences of unplanned, unauthorized, and unregulated development. Although these is a storm drainage network of around 261 sq. km around the City, historically, the major part of Dhaka’s drainage system is natural consisting of canals, rivers and lakes that help reroute extra water out of the City. These water bodies act as natural flood plain, storm sewers, water retention areas, and as surface water bodies to check flood flows and allow water to percolate to the ground. Storm runoff from surrounding areas is stored in these lowland areas and the accumulated run off drained through the canals. Until only three decades ago, Dhaka had over 50 canals and lakes and was surrounded by four rivers and wetlands. 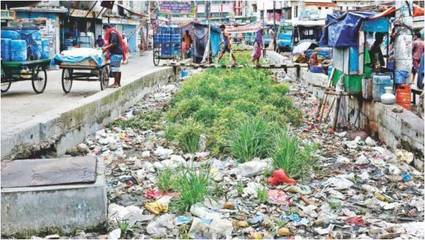 Over the years, however, the Capital and largest City of the country has lost almost all of its natural drainage system and of the 50 canals that were flowing until 80s now have meagre flows in only 20, thanks to unabated encroachments from both public and private sources. 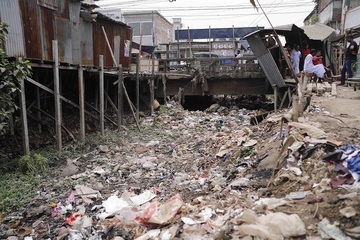 The two main reasons behind the disappearing canals are the creep of construction and the dumping of massive quantities of garbage from the surrounding neighborhoods. Another 9 canals having flow of over 10km have been converted into box culverts proved ineffective for the region as they require regular maintenance and clean water. 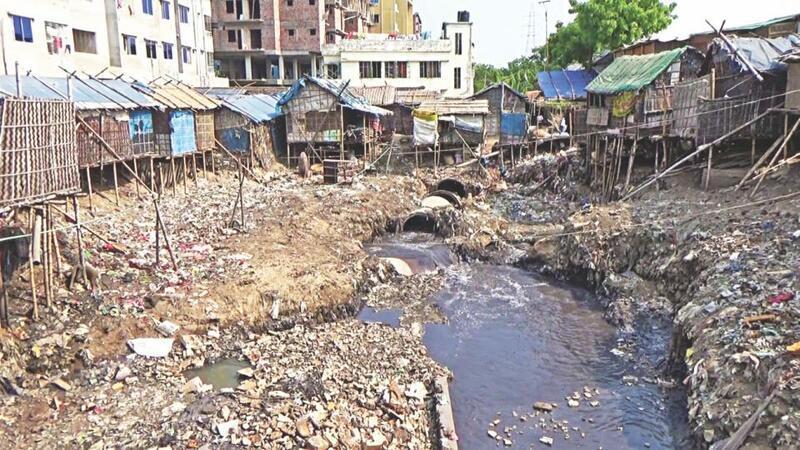 While recent water logging in the City of Dhaka clearly points to the curse of unplanned and unregulated development, concerned authorities have long ignored the illegal encroachment upon the canals and have failed to re-excavate, demarcate and properly monitor their condition. 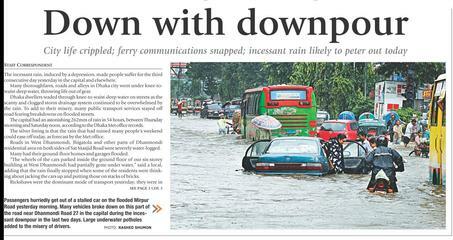 Due to such monumental failures of the authorities to regulate development and protect the water bodies, some areas of the Dhaka City now experience water logging even with regular rainfalls. Experts have unambiguously stated that the loss of wetlands including canals within and around Dhaka City and the resultant collapse of the natural drainage system is causing the crippling and ever deteriorating water logging in the City. 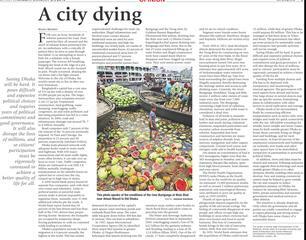 A 2015 World Bank report predicted that the potential damage from water logging for Dhaka between 2014 and 2050 would be Taka 11,000 crore. 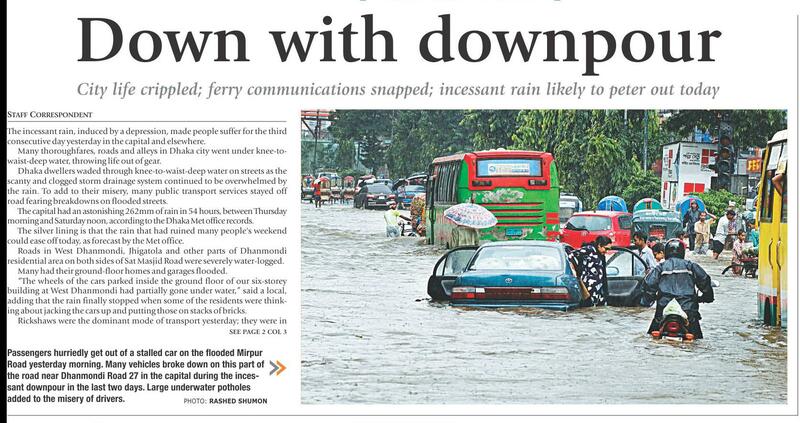 The report further stated that when more intense rainfalls as a result of climate change are taken into account, the loss would be Taka 13,900 crore between 2014 and 2050.The Dhaka Water Supply and Sewerage Authority (DWASA) has estimated that in September, 2010, water logging caused a loss of Taka 632 billion for the garment industry alone. The curse of such waterlogging affects most the poorest who, due to absence of alternate shelter, remain marooned and deal with unbearable miseries. A Writ Petition (16898/2017) has been filed by Bangladesh Environmental Lawyers Association (BELA) before the Supreme Court of Bangladesh seeking restoration of the 50 canals of Dhaka by demarcating the same as per their original flows, removing all encroachments and structures including box culverts from the canals, and protecting them under a time bound action plan. Project Details The major canal systems in and around the capital are the (i) Degun–Ibrahimur–Kallyanpur canal that drains out to the Turag River; (ii) the Dhanmondi–Paribagh–Gulshan–Banani–Mohakhali–Begunbari canal that drains out to the Balu River, and (iii) the Segunbagicha–Gerani–Dholaikhal canal that drains out to the Balu and Buriganga rivers. Relevant government actors Ministry of Land; Ministry of Environment and Forest; Ministry of Water Resources; Ministry of Housing and Public Works; Dhaka City Corporation (North); Dhaka City Corporation (South); National River Protection Commission; Department of Environment; Dhaka Water Supply and Sewerage Authority; Rajdhani Unnayan Kartipakkha; Bangladesh Water Development Board; Deputy Commissioner, Dhaka; Dhaka Metropolitan Police Commissioner. 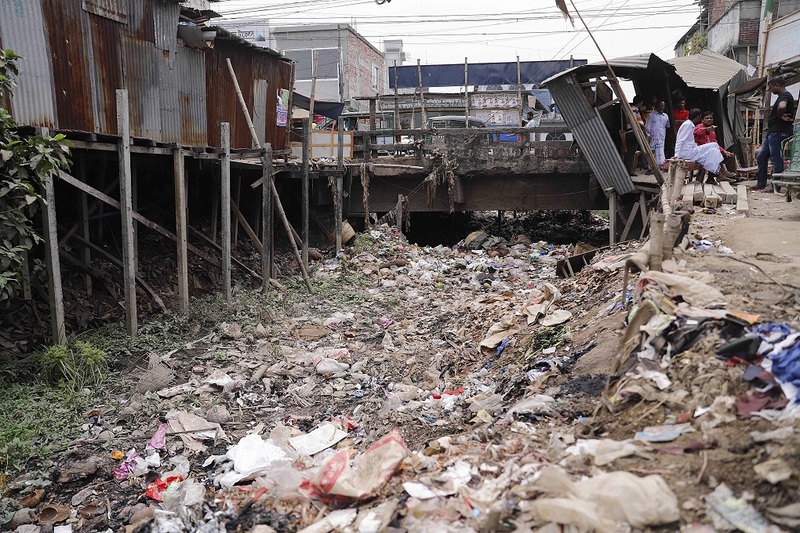 Other The virtual collapse of the natural drainage system of the City has not only affected the 16 million City dwellers with urban flooding but has also affected the traditional livelihood earners like the boatmen, fishermen and so on. Although no concrete study has been undertaken, it is obvious that depletion of the surface water flows has affected the aquifer, a crisis that has already been discussed in the Parliament. Other Poor communities having no access to alternative sources of water use the contaminated water of these canals that give them skin diseases and intestinal problems. 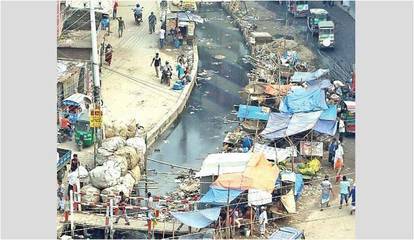 The stagnant water of the canals have turned into breeding grounds for mosquitoes leading to water borne diseases like malaria, diarrhea . Other It has been reported in the national media that in connivance with the land administration offices, influentials have grabbed the lands of the canals and have built structures thereon. Land office is accepting taxes from the grabbers and paving ways for them to strengthen their illegal possession. The government is now planning to recover five canals not by punishing or evicting the encroachers but by purchasing back lands from them although the same clearly belonged to the government and have been grabbed. While waterlogging causes terrible sufferings to office and school goers and other commuters, accidents happened when pedestrians fell into uncovered manholes under clogged water. With grabbing of wetlands like the canals, the blue lines of the over populated City have disappeared and some potential sources of recreation lost. Development of Alternatives A Writ Petition (16898/2017) has been filed by Bangladesh Environmental Lawyers Association (BELA) before the Supreme Court of Bangladesh seeking restoration of the 50 canals of Dhaka by demarcating the same as per their original flows, removing all encroachments and structures including box culverts from the canals, and protecting them under a time bound action plan. On 4th December, 2017 a division bench of the High Court has issued a show cause on the government to clarify as to why their failure to protect the Canals from encroachments, obstructions and pollution shall not be declared unlawful and against the public interest, and why they shall not be forthwith directed to protect and restore the said Canals by removing the encroachments and harmful structures and pollutants. The Court also directed the government agencies to prepare and submit before it (i) a report on the status of the Canals, and (ii) a time-bound action plan for recovering and restoring the Canals. The report shall have to be submitted in six months time from the date of issuance of the Rule. Why? Explain briefly. The final decision will come from the High Court Division of the Supreme Court of Bangladesh. Given the complications created in the land records and the powerful actors involved in the grabbing, restoration of all 50 canals shall be extremely challenging. Meanwhile, the government has just approved a project that is aiming to bring back flows in 5 canals. This costly project may be over-publicized by the executive through drum beating causing delay in restoration of the remaining canals. Further, the costs of eviction is prohibitive and the move of the government to purchase lands from the grabbers may give legitimacy to the occupiers who will try to drag on by engaging into litigation.